There never will be a definitive recording of Idomeneo, if only because the opera exists in so many different versions. Mozart wrote a very long score, and even before its Munich première in 1781 he was cutting music. Further cuts have been made since then, and up until recent years, the opera usually was presented in a truncated form, with whole arias and scenes missing. For example, the 1956 recording from Glyndebourne, conducted by John Pritchard, is only 143 minutes in length. This same recording highlights another perplexity. Mozart intended the role of Idamante, Idomeneo's son, to be sung by a castrato. These are in short supply today. Pritchard assigns the role to a tenor, Leopold Simoneau. Many recordings from the 1950s and 1960s do likewise. It is only in the last twenty years or so that Idamante has been sung by a mezzo-soprano, as is done on this new recording. Mackerras now presents a substantially complete Idomeneo, omitting only music that Mozart himself took out willingly before the première. The conductor even retains the lengthy ballet at the end of the opera, even if it is an anticlimax that feels dramatically wrong today. As recorded here, Mackerras's Idomeneo would be hard to bring off onstage, but it's rewarding to hear it at home. Another factor that makes Idomeneo a "tough sell" for today's audiences is its old-fashioned character. When demons drag Don Giovanni down to hell, that's believable drama, but when a sea monster rears up in Act Two of Idomeneo and terrorizes the people of Crete like Godzilla, that's dated – shades of Gluck or Monteverdi! The characters are not really human; they only represent human emotions and qualities such as love, jealousy, self-sacrifice, and leadership. Hence, it is difficult for listeners to become emotionally engaged with this opera, beautiful as much of the music is. Arias such as Idomeneo's "Fuor del mar" and Elettra's "D'Oreste, d'Aiace" ensure this opera's survival, but it's never going to be a crowd-pleaser like the Da Ponte operas. One curiosity to mention here is the similarity between Idomeneo and the story of Abraham: both nearly sacrifice their sons for the sake of God (or a god) but are stopped at the last moment through divine intervention. This is an excellent recording, albeit one which doesn't contradict the opera's cool classicism in the slightest. The standout is Ian Bostridge in the title role; his coloratura in "Fuor del mar" is tossed off without effort, and he fully encompasses the character's paternal tenderness and royal bearing. Perhaps he sounds a little too young, but he has the right sound for Idomeneo, which is more than I can say about competition such as Pavarotti, who actually recorded this opera in 1983! Lisa Milne – her name is new to me – is a sweet, pure-voiced Ilia, and Lorraine Hunt Lieberson's Idamante is a good match for her. Barbara Frittoli's Elettra is a little short on character, but she contributes a passionate "D'Oreste, d'Aiace" at the opera's end. With his often omitted arias restored, Anthony Rolfe Johnson is kept busier than he otherwise would be, but he still seems a little wasted as Arbace. He would have been an excellent Idomeneo too – not to fault Bostridge! The smallish, precise sounds produced by the Scottish Chamber Orchestra and the Edinburgh Festival Chorus keep this Idomeneo from getting too grand. Am I wrong in thinking that Mozart would not have deplored a "bells and whistles" approach to this score? Mackerras keeps everything moving along moderately, eschewing any great contrast in tempos, although he is very sensitive to niceties in scoring that other conductors miss. 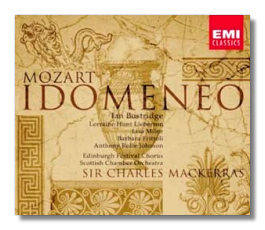 Recorded in Edinburgh's Usher Hall, Mackerras's Idomeneo boasts excellent sonics. The 178-page booklet contains essays by Stanley Sadie and the conductor, a synopsis, the text, and translations in three languages.